1. How might different forms of art, such as theatre, film, historical artifacts, and even non-representational/non-figurative abstract visual art potentially provoke and challenge people to take on the experiences of others who live quite different lives from our own? 2. Does art attract empathic people? Does it foster empathy in people who come to art? Or could both things be true simultaneously? 3. Why do some instances of art succeed in encouraging the audience to empathize with someone quite different from him or herself, whereas other instances of art might fail to do so? 4. How might art affect children differently from adults, with respect to the promotion or engagement of empathy? This night was also a reminder to me of the absolutely fantastic work that Roots of Empathy does throughout the world. 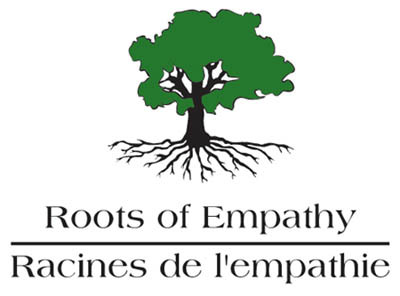 For those who don't know, Roots of Empathy is a program in which young schoolchildren, often those living in under-served neighbourhoods, are guided through a series of lessons centred around visits by a parent and her baby. I had the very good fortune of witnessing the program in action and I have to say it's absolutely amazing. You can read more about my take in a previous post. Please consider supporting this wonderful organization in any way you can. For those interested in making a financial contribution, it is possible to do so here. A huge thank you to the organizers for allowing me to a part of this, Mary for her deft moderating skills, and Cameron and Martha for fostering such an interesting and entertaining discussion.